With Christmas fast approaching and Black Friday and Cyber Monday three weeks away, my thoughts have definitely turned to making sure that we are all set for Christmas. If I get the chance to I enjoy entering a few competitions in the run up to Christmas to see if I can add a few prizes to the present pot. I've spotted a fantastic giveaway over at Halfords to really help to build excitement for their Black Friday offers, with over £1500 prizes on offer it would be guaranteed to make Christmas much easier for the lucky winner. There are three prize bundles available and they include bikes, tool sets, sat navs, car stereos and more. It's really easy to enter the giveaway, click on the image above for your chance to win. It's really simple to enter, just click through to the Black Friday giveaway, select your answer and fill out your details. While you're on the Halfords website why not check out their range of offers available? On Black Friday last year they had great discounts on a range of brands including TomTom, Garmin and Autoglym. These could be the perfect gift for those car or gadget lovers. Cycling lovers won't be disappointed either with offers across Apollo and Carrera bikes, accessories and fitness equipment. You'll find a range of offers on the Halfords website and in store over the coming weeks. 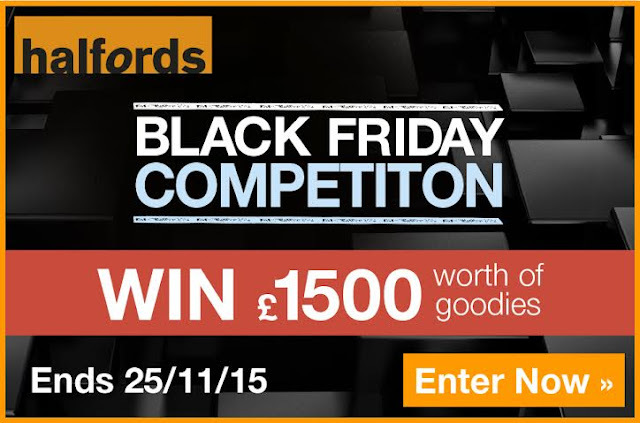 Head over to Halfords and enter the giveaway today.